Visualises user data which is pulled in from custom profile fields. 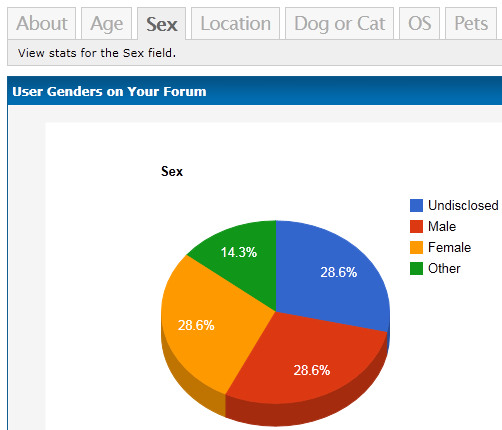 This plugin allows admins to see demographics about their users, using the custom profile fields you've setup on your forum. It supports select, multi-select, checkbox and radio profile fields. It uses the Google Charts API and this does add to the load time of the MyDemographics ACP section. But because it's Google they are very reliable. The data is based on user input, so obviously it only uses data that isn't blank. So it's not a complete 100% representation of your userbase unless they've all filled in all the profile fields. In some cases the amount of data pulled in is too diverse to visualise and the plugin will tell you this. Installation instructions in the Read Me. 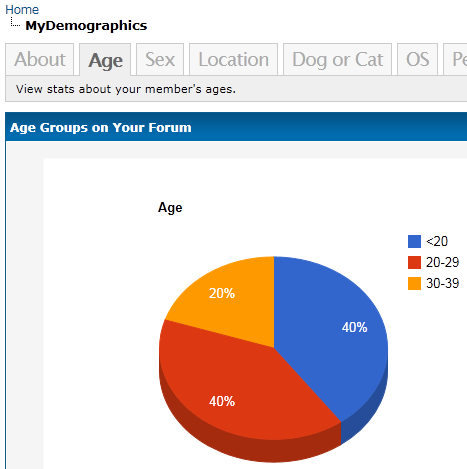 More info about how to use the plugin in the ACP>Users&Groups>MyDemographics section.